Attacks against women’s dignity and safety at work and in society are widespread and growing, and few governments or employers are willing to take adequate measures to stop it. It is therefore urgent that unions actively support the call by the United Nations’ Special Rapporteur on violence against women for a universal legally binding instrument at the United Nations level. 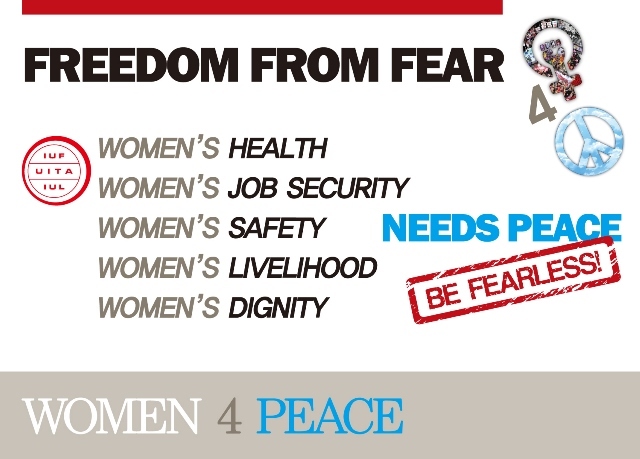 On International women’s Day 2015 IUF affiliates in the Asia/Pacific region mobilized under the banner ‘Women for Peace’ in response to the resurgent militarism in the region and a militarization of politics that threatens democracy and further undermines the position of women and the fight for equality. How many more reports and evidence are needed to show the links between precarious forms of employment and sexual harassment at work before the fundamental right to a safe workplace is respected? How many more studies are needed to document the extent of suffering and the losses to society generated by gender-based violence? How many more reports on violence against women and girls in armed conflicts are needed to persuade governments of their responsibility to protect women and children from those atrocities? 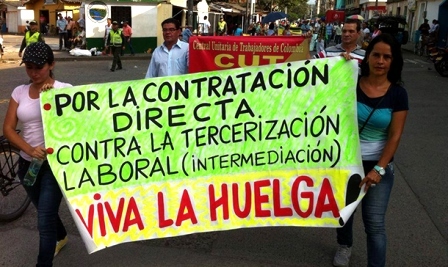 The IUF-affiliated SINTRAINAGO has won direct, permanent contracts for cane cutters at the Risaralda mill in western Colombia’s Cauca Valley. The breakthrough agreement was signed on March 5 following a brutal attack on strikers by state anti-riot forces and company guards.